The Maplewood flag was designed in honor of Gilbert Baker's original 1978 rainbow flag. 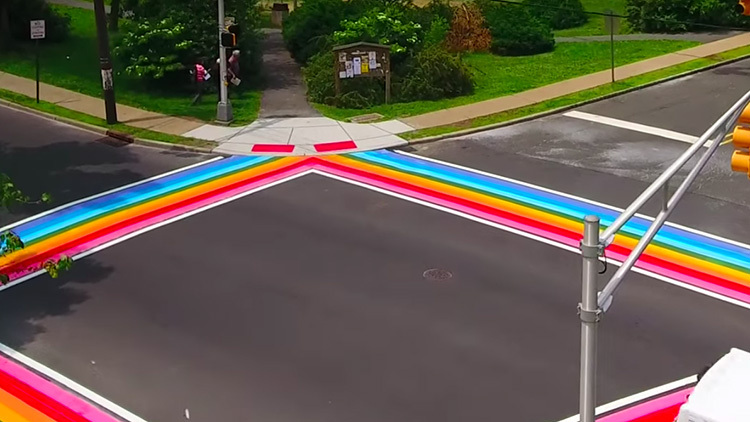 Maplewood, N.J. became the first town in that state to install permanent rainbow crosswalks indicating the community’s dedication to LGBT inclusivity when it unveiled the giant rainbow stripes at the intersection of Valley Street (a county road) and Oakview Road during Pride month on Thursday, according to New Jersey.com. "We want to do something that would serve as a permanent marker or symbol of our commitment to inclusion," Dean Dafis, the first out member of the Maplewood Township Committee, said. "I wanted it to be something you can encounter every day. We want our youth in particular -- perhaps those struggling to find their way, those in need of empowerment and affirmation -- to proudly cross or walk over their fear and self-doubt." Maplewood’s flag hearkens to LGBT history more than most modern depictions of the rainbow flag as it uses the colors of rainbow flag creator Gilbert Baker’s original 1978 design and not the stripes that are typically used today.